Edward Wilson believed in America, and he would sacrifice everything he loved to protect it. Matt Damon, Angelina Jolie and Robert De Niro star in this powerful thriller about the birth of the CIA. Edward Wilson (Damon) believes in America, and will sacrifice everything he loves to protect it. But as one of the covert founders of the CIA, Edward's youthful idealism is slowly eroded by his growing suspicion of the people around him. Everybody has secrets - but will Edward's destroy him? With an all-star cast including Alec Baldwin, Billy Crudup, William Hurt, Timothy Hutton and John Turturro, it's the gripping story David Ansen of Newsweek hails as "spellbinding." $14.142 million on -unknown- screens. With a stellar cast, a famous actor moonlighting as director, and a serious subject matter, 2006’s The Good Shepherd looked like real Oscar-bait. However, the movie failed to make much of a dent with the public, the critics, or those who choose the awards. And for good reason, as Shepherd offers a muddled look at the development of the CIA. The film opens in April 1961 and introduces us to an operative named Edward Wilson (Matt Damon). After the Bay of Pigs debacle, the CIA believes they have a mole in their midst. Edward gets the job to locate this disloyal entity, a task that leads to complications in his personal life. The film also informs us about Edward’s history in flashbacks. Heading to 1939, we watch him as a student at Yale and see how his time in the secret Skull and Bones society leads him to enter the OSS, the group that became the CIA. We also see his college romance with Laura (Tammy Blanchard) and how this first love ends after he gets seduced by – and impregnates – Clover (Angelina Jolie), the sister of a fellow S&B member. He must “do his duty” and marry Clover, a fact that leads him into an essentially loveless marriage. The movie cuts between Edward’s 1961 investigation and how his time in the CIA brought him to that point. We also see the impact on his family. At the very least, I must credit Shepherd as an ambitious film. It aspires to mix the story of the CIA with a personal drama and span these events across a couple of decades. The epic scope means that the movie bites off quite a lot. So why does the end result seem so flat and uninvolving? Shepherd doesn’t work for a number of reasons. One comes from the chronological structure. I understand what director Robert De Niro wanted to do as he mixed the investigation into the mole with the tale of Edward’s career, but it doesn’t prove satisfying. The film doesn’t need an unconventional chronology to tell its story, and the jumps become more distracting and off-putting than anything else. It doesn’t help that the tale itself becomes a mess. I can’t decide if Shepherd feels like a 90-minute movie padded to almost three hours or a five-hour flick cut down to that length. The flick moves at a glacial pace and packs in so many subplots that it becomes barely coherent. Many of these don’t go much of anywhere, which leaves us with the impression of a picture stretched too far – or one chopped down so much that its pieces lose connection. This lack of direction doesn’t make the movie hard to follow. However, it does turn into something tough to enjoy. Heck, entertainment value be damned - I’d be happy if Shepherd simply held my interest. It never manages to involve us, as the muddled focus keeps us at a distance. Ultimately, I think Shepherd suffers from self-indulgence most of all. De Niro clearly is an actor’s director, as he seems unable to cut any of the performers’ work. He can’t tell the wheat from the chaff, so he throws everything into the mix. That results in the terribly slow pace of the flick. The movie plods along at such a sluggish rate that it often becomes tough to remain awake. With Damon’s Edward as the heart of the story, matters become even more boring. Damon plays the part completely devoid of personality. I guess that’s the point, but it becomes tough to focus on such a bland character for almost three hours. The thinness of the role doesn’t help; we get some basic obvious exposition that supports the theme of duty vs. desire, bur nothing else develops. Shepherd ends up as a long-winded bore. It wears its political heart too much on its sleeve as it alludes to current abuses of intelligence, but even those elements can’t generate any heat. Instead, the film feels like it treads water the whole time. The tale moves but goes nowhere. 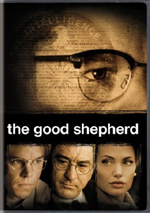 The Good Shepherd appears in an aspect ratio of approximately 2.40:1 on this single-sided, double-layered DVD; the image has been enhanced for 16X9 televisions. While not truly flawed, the transfer seemed less memorable than I’d like. For the most part, sharpness looked decent. Occasionally the movie came across as somewhat ill-defined, but the majority of the film appeared acceptably concise and accurate. I noticed no signs of jagged edges or shimmering, and edge enhancement was minor. No source flaws cropped up to mar the presentation. The somber world of the CIA wouldn’t seem right with a vivid palette, so expect low-key hues here. The film displayed lots of browns and grays; more dynamic colors appeared on an irregular basis. Within the design parameters, the tones seemed fine. Blacks were deep and firm, while shadows showed good clarity and delineation. The sharpness seemed a little too lackluster to merit a grade above a “B”, but the problems didn’t seem severe. Matters improved a little more with the Dolby Digital 5.1 soundtrack of The Good Shepherd. The soundfield presented a surprisingly involving setting. Although the mix rarely became terribly active, it offered more info than I anticipated from such a chatty flick. The track always created a good sense of place and used nice imaging for music. 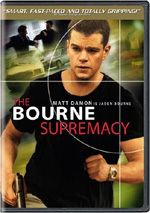 A few more action-related sequences used the surrounds well and made the mix engrossing. Audio quality seemed very pleasing. Music was lush and rich, while effects came across as tight and accurate. Low-end represented strong depth and offered tight material. Speech was natural and concise, with no edginess or other issues. This was a consistently satisfying mix. Don’t expect many extras here. We discover a collection of seven Deleted Scenes that fill a total of 15 minutes, 58 seconds. The disc gives us “John Comes Home” (4:03), “Edward and Sam At Train Station” (1:18), “Edward Confronts John” (1:42), “Edward Asks Valentin to Play Violin” (2:24), “John Enters Embassy/Edward and Clover Fight” (2:02), “Ulysses Is Trying to Tell Us Something” (2:12) and “Edward and Ray Pack Office” (1:50). The most significant additions come from the re-introduction of Clover’s brother John. The theatrical cut kills him off, but these segments use him in a different way. It’s a redundant tangent that shouldn’t have been in the flick. Most of the others concentrate on the agency’s Russian spy, and they also fail to add anything significant. A few ads open the DVD. We get promos for Smokin’ Aces, HD-DVD, Law & Order, Hot Fuzz and Children of Men. Chalk up The Good Shepherd as one of 2006’s big disappointments. With a strong cast and pedigreed participants all over the place, it looked like it’d become a real winner. Instead, it turned into a dull, rambling affair that never satisfied. The DVD offers good picture, very nice sound, and a small collection of extras. I can’t recommend this unexceptional DVD or the muddled movie it presents.